The 1622-2RS and 1622-ZZ is a 7/16 ball bearing that is found in many applications. The 1622-2RS ball bearing has two contact rubber seals one on each side of the ball bearing. The 1622-ZZ ball bearing has two non-contact metal shields one on each side of the ball bearing. If your application requires a 1622 ball bearing with only one seal or shield you can get this ball bearing and take one of the shields or seals off. 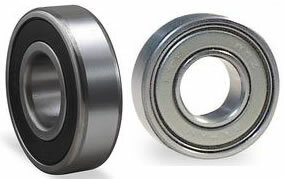 This 7/16 inch ball bearing is high quality and can take electric motor demands if needed.